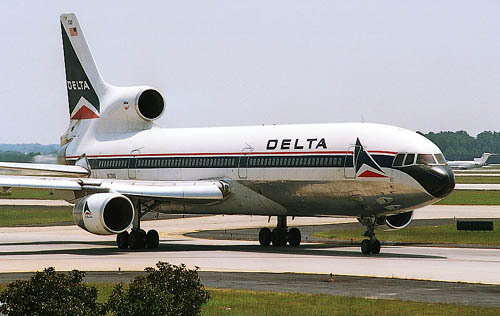 For "ages" Delta was true to this colourscheme, as shown on this Lockheed L.1011 Tristar 250 (N1738D c/n 193C-1234). Delta had an image of conservatism and true to company traditions; however, in the fight for passengers, a change of course was requiered. 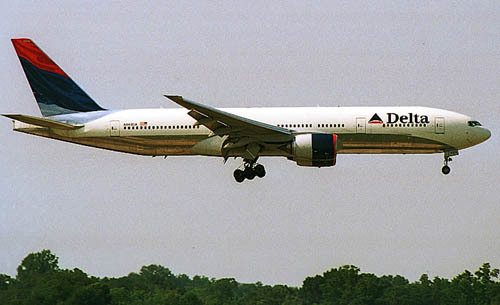 All these photos were taken in July 2001 and a few months later the last Tristars were phased out from Delta's fleet. N507DA is a 727-232 (Advanced) with c/n 21309/1294. I found most 727s had been painted in Delta's "intermediate" colourscheme, but events of "9/11" (2001) brought the US aviation industry in a big recession and the 727s were sent to go. Reuters published the following on 08Apr03: "Delta Retires Last of Aging Boeing 727s"
Delta Air Lines Inc said on Tuesday that it has retired the last of its Boeing 727 jetliners and plans to stop flying McDonnell Douglas MD-11 jets later in 2003 under a fleet simplification plan. Atlanta-based Delta, the No. 3 U.S. air carrier, said it retired its last 727 on Tuesday, ending more than 30 years of operating the three-engined jets that were once workhorses for the airline. The last commercial 727 flight for Delta was flown from Greensboro, North Carolina, to Delta's Atlanta base on Sunday. Delta had acquired 184 of the jets over the years. McDonnell-Douglas MD-88 N929DL (c/n 49716/1531) is seen here at Atlanta-Hartsfield IAP in a colourscheme I describe as "intermediate" and began to appear in 1998. Apparently it was hard to steer away from the previous colourscheme, but this was found not to be in touch with the times. The change in colourschemes: in the foreground the colourscheme which so long represented Delta and behind the "intermediate" colourscheme. All 3 colourschemes were seen in the fleet at the same time. Ray Pelot sent me this: "I work out here in ATL and we have refered to the 1998 scheme as the Ron Allen c/s, since he was the one who approved it. Now the new 2000 scheme is called the Wavey Gravey or as some people put it: Deltaflot. But most of use "the Wavey Gravey." Thanks Ray ! Someone else knew a variation to Deltaflot: Dixieflot ! Scott told me "flowing fabric" was used by corporate folks, but this never hit the streets. Cheatlines disappeared during the 1990s rapidly and the new colourscheme of Delta followed thi sdevelopment as well. The new colourscheme has the fluid lines we see on many airplanes at the start of the 21st century. Shown here is Boeing 777-232(ER) N863DA (c/n 29735/245) on final approach into ATL. 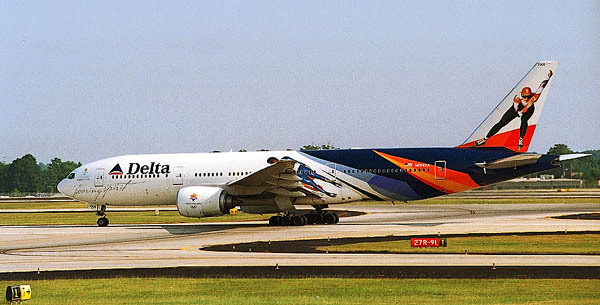 This colourscheme began to appear in 2000 and was first introduced on the new Boeing 777s. Boeing 777-232(ER) N864DA (c/n 29736/249) proudly carried the special colourscheme "Soaring Spirit", to celebrate the Salt Lake City 2002 Olympic Games. The special colourscheme lasted till January 2003, when it was removed and N864DA was resprayed in the latest colourscheme. 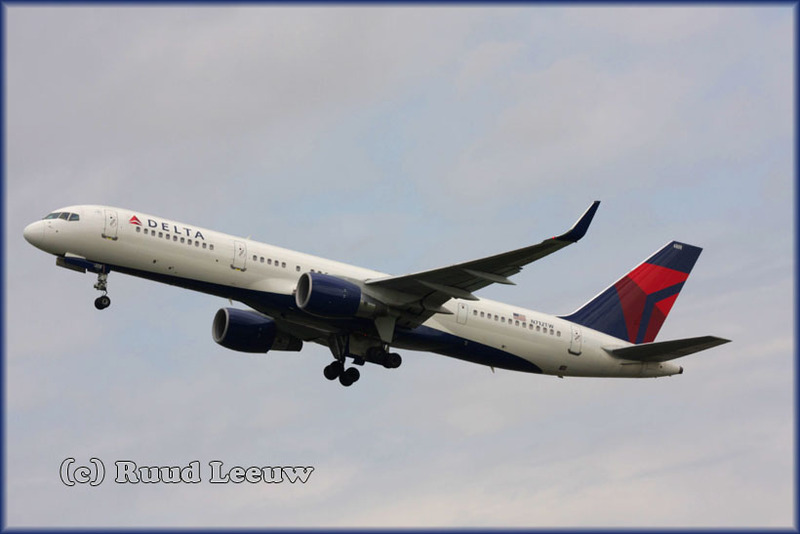 The aircraft is Boeing 757-2Q8 N712TW (c/n 27624/760) in take off at Amsterdam IAP (09Aug08). By this time it had become quite common to cross the Atlantic in a single-aisle aircraft (instead of previous wide bodies). 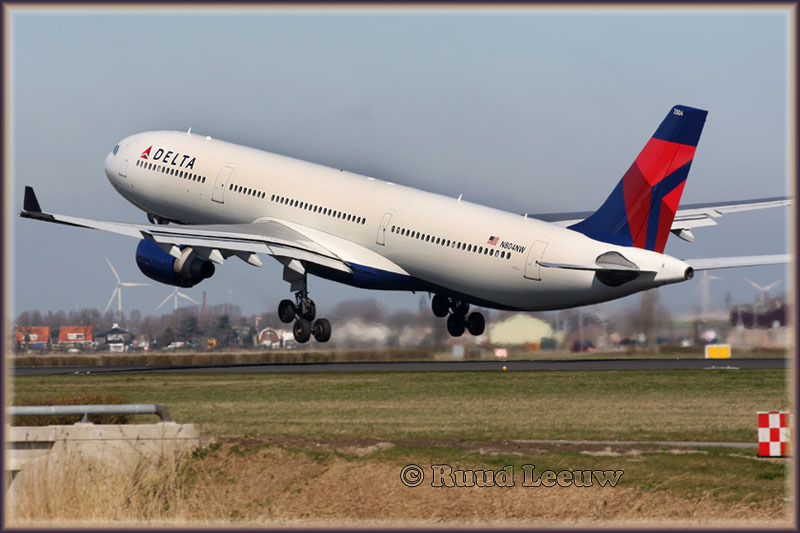 Airbus A330-323X N804NW takes off from Amsterdam IAP on 01Apr09. The tailnumber indicates a Northwest Airlines aircraft..
Delta acquired 100% ownership of Northwest in 2008 and plans to fully integrate Northwest into the Delta family. The NWA brand will gradually be phased out and Delta's name and brand will replace it.